J. R. Carpenter is an artist, writer, and researcher working across live performance, print, and digital media. 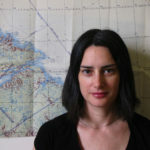 Her digital writing has been presented in journals, galleries, museums, and festivals around the world. This is a Picture of Wind, a weather poem for phones, won the Dot Award for Digital Literature 2015. Her hybrid print and web-based work The Gathering Cloud won the New Media Writing Prize 2016. A book by the same name was published by Uniformbooks in 2017. Her debut poetry collection, An Ocean of Static, published by Penned in the Margins, was highly commended for the Forward Prize 2018.